Hikers in the UNESCO World Heritage-listed terraced vineyards of Lavaux enjoy easy walks and fantastic views of grapevines, Lake Geneva, and the Alps. 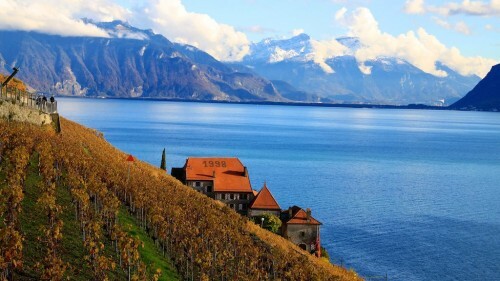 The historic terraced vineyards in the Lavaux region in Switzerland offer endless opportunities for easy hikes with marvelous views of Lake Geneva (Lac Léman) and the Alps. The grapevines are beautiful from early spring to late summer but never more spectacular than during autumn. 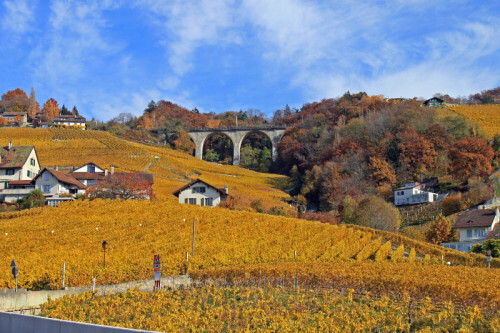 This famous Lavaux wine-producing area is easily reached on public transportation for wonderful day-trips from Geneva, Lausanne, Bern, and Montreux. The steep slopes and terraced vineyards of Lavaux on the northern shores of Lake Geneva form one of the best-known wine producing regions of Switzerland. The Lavaux appellation area is 830 hectare and spread over 23 communities between Lausanne and Chateau de Chillon past Montreux in Villeneuve. 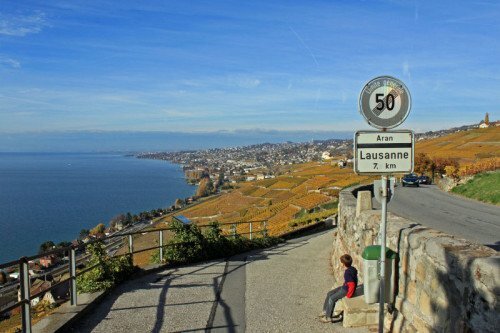 However, the beautiful terraced slopes of Lavaux are primarily associated with the area between Lausanne and Vevey, where visitors can enjoy fantastic views of the vineyards, Lake Geneva, and the Alps. Wine has been produced in Lavaux since Roman times but the famous terraces were first built by monks during the eleventh century. Despite the use of very modern production techniques, it often looks as if time stood still for centuries in some of the picturesque villages and impossibly steep slopes planted with grapevines. The Lavaux terraces were added to the UNESCO World Cultural Heritage list in 2007. Book Lavaux Tours at GetYourGuide. Hiking opportunities abound in the vineyards of Lavaux. Hiking maps are easily obtainable in the region but are not really necessary for shorter walks. Terraces generally run parallel to Lake Geneva’s shoreline with steep roads and stairways that take visitors to different levels. Views are certainly different from higher levels but not necessarily better than from closer to the lake. For a full day of hiking, walk the Discovering the Terraces of Lavaux hike. This long-distance path is marked GT (Grand Traversée de Lavaux) and goes from Ouchy in Lausanne to Chateau de Chillon Castle between Montreux and Villeneuve. According to Swiss hikers, this 35 km trail should be done in around 8h30. All the walking is on paved paths or minor roads generally only used by agricultural traffic. Shorter hikes are very easy to do too and even a few minutes’ walk from a car park or train station can be very rewarding. Many benches and picnic spots are available for hikers while wine tasting at many estates is usually possible on weekends. One of the great places to hike in the Lavaux vineyards is in the area between Rivaz or St Saphorin on the lake level and Chexbres in the hills. From the terraces here, hikers can enjoy wide panoramas of Lake Geneva, the Alps, and the vineyards themselves. The walk from St Saphorin to Chexbres is longer but the slopes more gentle compared to the steep inclines on the direct Rivas to Chexbres roads. From the lake level to Chexbres should take less than an hour either way but it is easy and tempting to take the slower scenic routes. All three towns have railway stations and plentiful parking while Rivaz has a boat landing for pleasure boats cruising on Lake Geneva. St Saphorin has the more interesting small old town but Rivaz has the modern Vinorama, where around 200 wines from many different estates may be tasted. Another great area for hiking is Grandvaux. From Cully on the lakeshore, walk straight up the steep valley for marvelous views. Cully has parking, a railway station, and boat landing. Public transportation to the Lavaux makes it easy to reach the area from other parts of Switzerland and also makes it possible to avoid circular trails as there is usually a train back from the next town on the route. 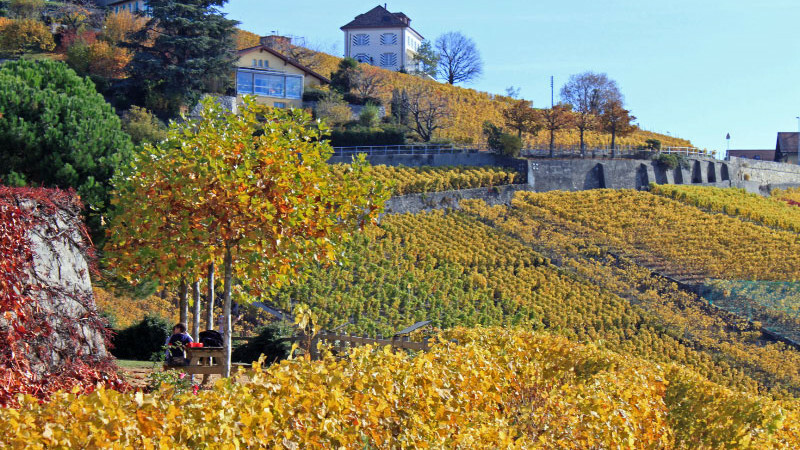 For autumn photos of the vineyards see Photos of the Lavaux and Photos of the Grandvaux.